The patient is a 31-year-old woman who has given birth to a preterm infant. Her pregancy was complicated by polyhdramnios. The placenta, which was submitted for examination, consists of a 641.0 gram (trimmed weight), 20.2 x 18.0 x 4.2 cm ovoid singleton placenta with attached cord and membranes. The chorionic plate shows diffuse, widespread involvement by numerous sharply circumscribed intraparenchymal congested lesions ranging from 0.4 to 3.5 cm and accounting for approximately 45% of the parenchyma. Histologically, the plate is characterized by capillary vascular lesions that permeate and distend villous structures. The lesions are set in a background of increased stromal collagenization. The diagnosis is diffuse multifocal chorangiomatosis. 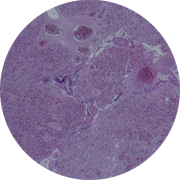 Chorangiomatosis is one of three benign, interrelated vascular lesions in the placenta - chorangioma, chorangiosis, and chorangiomatosis. Chorangiomatosis can be separated into focal, segmental and diffuse, multifocal. The diffuse multifocal variant is associated with more severe fetal complications including extreme prematurity (<32 weeks), congenital malformations, intrauterine growth restriction (IUGR), and intrauterine fetal demise. In addition, the placentas from these cases show delayed villous maturation, avascular villi and placentomegaly (>90th percentile).